As cannabis steadily moves from counterculture to mainstream, the time is perfect for 420TV, the new hub for cannabis news and entertainment, set to launch in early 2018. One of the new shows on 420TV will be a first-run animated series from long-time director of “The Simpsons,” David Silverman. Created for mature audiences, “SUPER SLACKERS” is a comedy about a group of lazy friends unwittingly thrust into the life of superheroes. 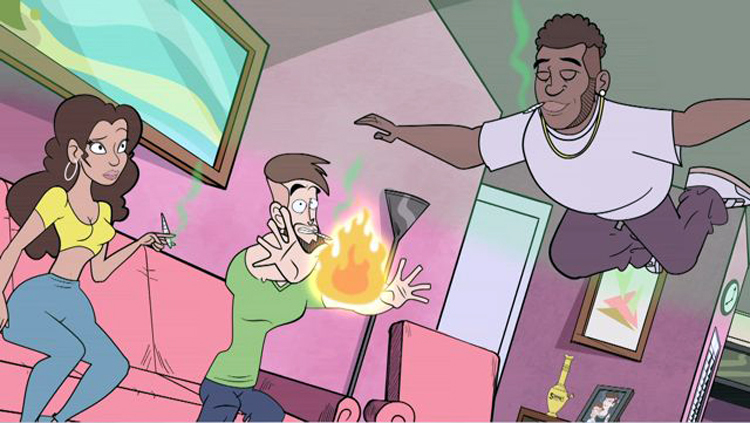 The animated series’ six-episode first season follows a group of friends who discover they have superpowers after their weed is switched with a new strain being used in a government experiment. When a Professor Xavier-type shows up to train them, they have no interest in saving the world. They agree to move into a rent-free government compound, but all they want to do is watch TV and play video games. The Professor is convinced he can turn them into the heroes that the world needs — but can he do it before their infectious laziness spreads to the rest of the agents? “SUPER SLACKERS” is created and directed by David Silverman (“The Simpsons”), written by Joelle Sellner (“Sonic Boom”) and animated by Mike Blum (Pipsqueak). Executive Producers are Mickey Gooch (Skit Bags Entertainment), Warren Zide (“American Pie”), digital entertainment manager/attorney Ash Venkatram and entrepreneur Ranajit Chaudhury. Usman Shaikh is Co-Executive Producer. The series was introduced to 420TV by talent manager Leanne Perice. “420TV is thrilled to be offering the latest animated comedy created by David Silverman, a wonderfully gifted animator who has a long history of producing tremendously successful shows. His new, first-run series, which will make its global premiere on 420TV, is equal parts funny, twisted and cool. ‘SUPER SLACKERS’ is also a perfect complement to our lineup, as we look to create and secure cannabis-friendly content for both the converted and the curious,” said Alex Nahai, a partner in 420TV. Debuting in early 2018, and initially available through 420TV.com and its mobile applications, 420TV is a premium 4K video-on-demand network devoted to all things cannabis. It will deliver original programming produced exclusively for the multi-platform channel, in addition to acquired long and short-form entertainment. Content categories in development include news, information, food, fashion, comedy, music and animation, as well as acquired feature films, documentaries, music and live streaming events. 420TV was developed by 420 Entertainment Group, comprised of OWNZONES Media Network, Genesis Media and Alex Nahai Enterprises. For more information, follow www.420TV.com. Cannabis humor is tricky. The subject comes with its own unique background that easily attracts goofy humor. It can also definitely have redeeming quality. I’m talking about overall quality and craft. In movies, think: Cheech & Chong. Seth Rogen and James Franco. In comics, think: Robert Crumb. Simon Hanselmann. 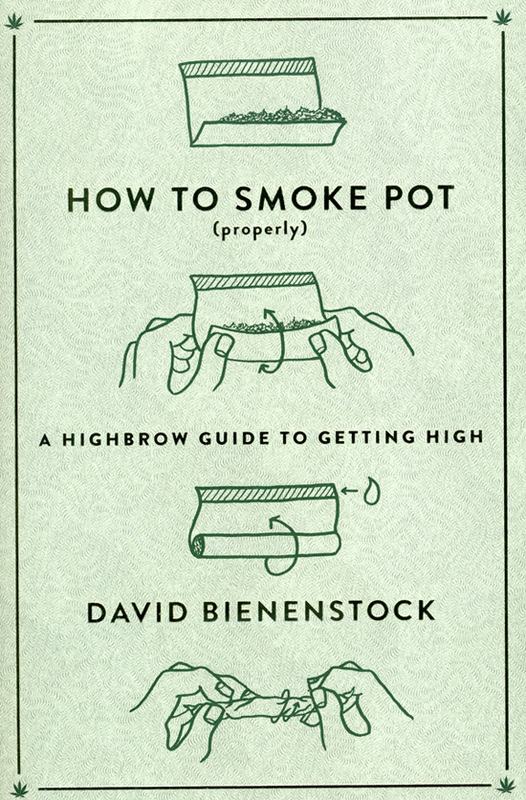 If you are really cool and smart about it, you can succeed with goofy jokes about pot. 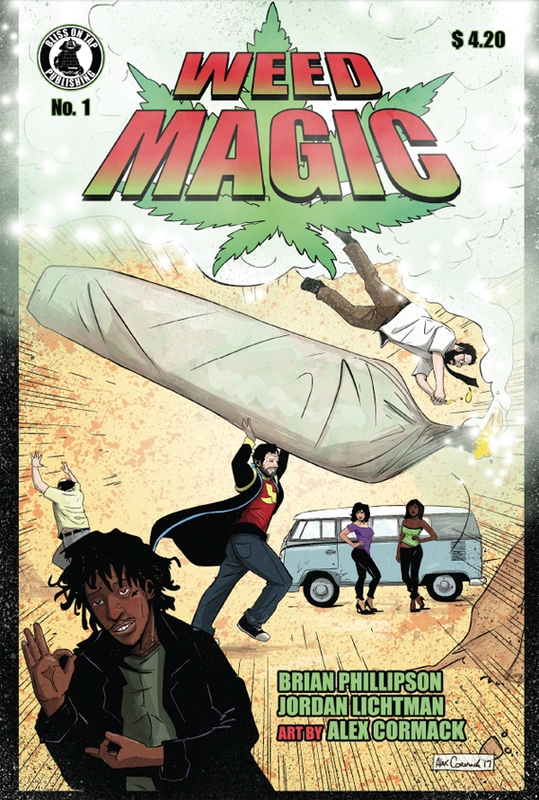 WEED MAGIC, published by Bliss on Tap Publishing, is a new comic book series that gives it a try. Let’s take a closer look. Here’s the deal: you are already preaching to the choir when you create a cannabis comic so you really don’t need to overstate your case. That is a big challenge to contend with. And, to be fair, you are also dealing with a variety of opinions and tastes. Some people think Kevin Smith is spot on with his cannabis humor and some think not so much. It does seem that people can get way too caught up in proving that they have cannabis cred and that they’re up for the most wildest of misadventures. In general, less is more. Some people think more is not enough. At first, I was leaning towards this being a problem for this comic. Attempts at going full-on Mary Jane can fall short and feel too generic and calculated. 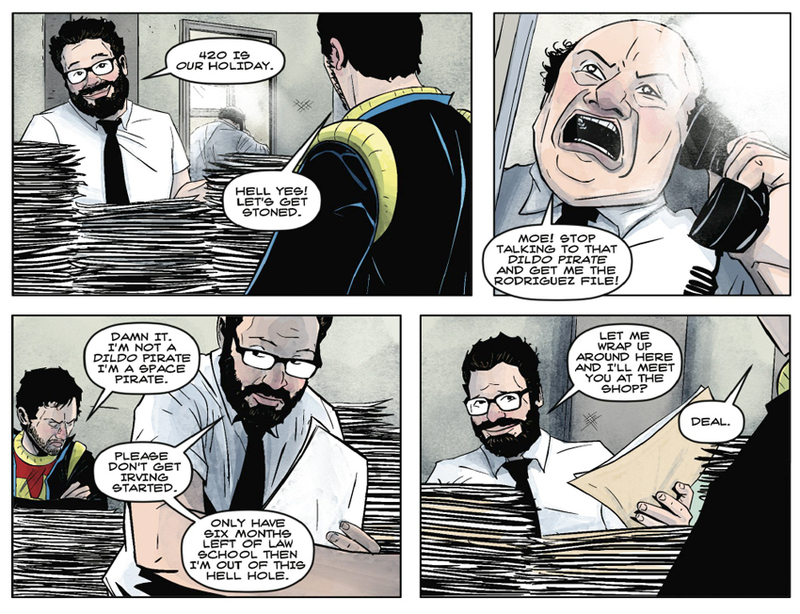 But, after careful consideration, I say this comic grows on me. 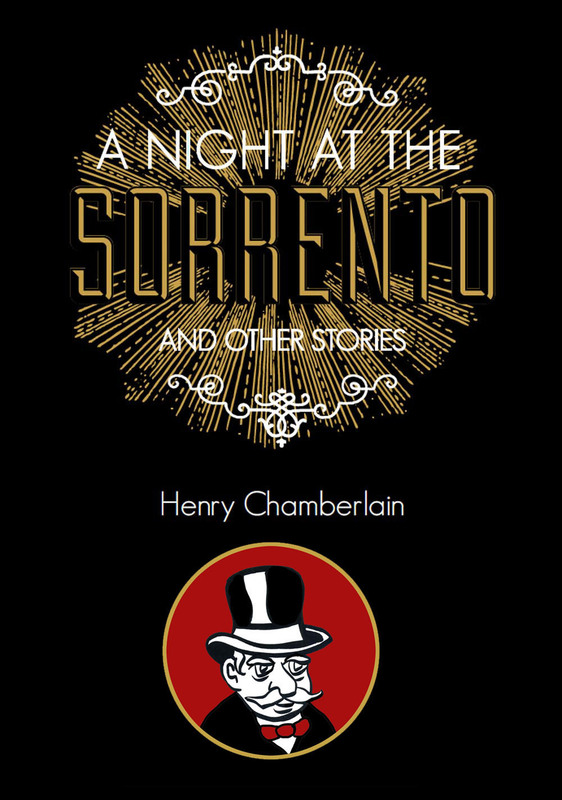 The narrative steadily takes form and the reader can expect to roll with the offbeat humor. This is light entertainment done right. 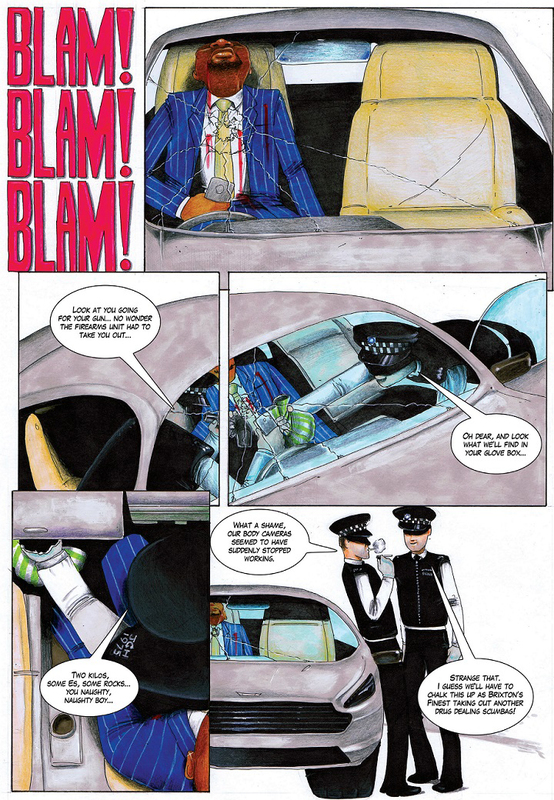 This is written by Brian Phillipson and Jordan Lichtman with art by Alex Cormack. Brian Phillipson is the president and co-founder of Bliss on Tap Publishing. It is easy for readers to take for granted the hard work involved in creating something that falls in the light humor category. But this is a sharp and well-executed smooth read. The dynamic use of color by Cormack is in step with the pace and humor. We’re in good hands down to spot on lettering by Alex Murillo. …then, one day, they stumble upon a big bag of magic weed. 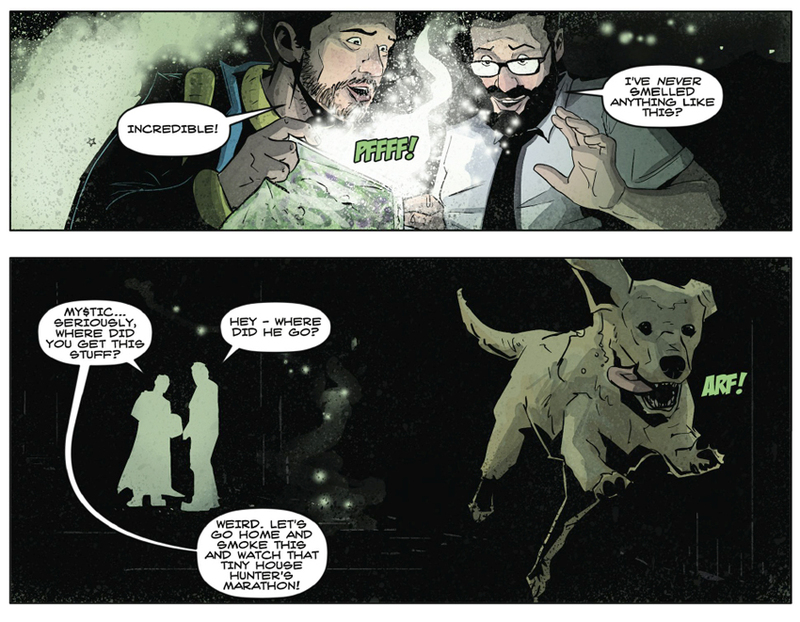 The story does a good job of playing off the typical superhero origin story. Set in Los Angeles, in Hollywood, we follow two friends as they discover their true destiny. Bunny Cortez dreams of making it big as a filmmaker. Moe Green is more down to earth as a law clerk on a fast track to becoming an attorney. But both of these guys are not happy, at least not as happy as they’d like to be. Until, one day, they stumble upon a big bag of magic weed. Hey, I could see this attracting the attention of Seth Rogen and James Franco or the next wave of talent that aspire to be Rogen and Franco. It could happen. Lastly, we’re just discussing the first issue here. From what I see, I am intrigued and look forward to the collected trade. All in all, a strong first issue. Seek this out. WEED MAGIC is available as of October 4: digitally on all major distribution platforms, including Amazon, Apple iTunes, Hoopla, Comixology, Google, Scribd, Nook, and Drivethrucomics. And for fans attending New York Comic Con (October 5-8), Bliss on Tap will be featuring WEED MAGIC at booth 945 along with a special collectible. Visit Bliss on Tap right here. As we here in the States, along with the rest of the world, continue to deal with the orange menace, it’s good to gain strength from our friends across the pond. 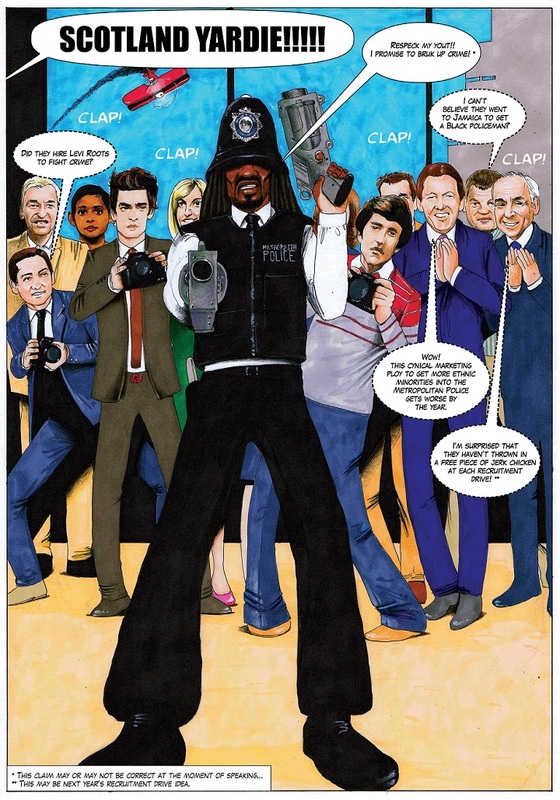 One thing that the creators of the graphic novel, SCOTLAND YARDIE, want you to know is that things are bad all over. Bobby Joseph and Joseph Samuels provide some dark humor for these hard times. This is a provocative work, set in south London, with a smart and gritty vibe. No doubt, Bobby Joseph (script) and Joseph Samuels (art) make no bones about their dismay with the current (and ongoing) state of affairs. With such clownish characters in the media, and in government (gasp), stoking the fires of hatred, racism, and xenophobia with such intensity as we have not seen before in recent memory, any form of satire can be cathartic. In this case, we have a plot involving the Brixton Metropolitan Police in need of some diversity. Enter Scotland Yardie, a ganja smoking, no-nonsense “bad bwoy” cop who breaks all the rules to enforce his own harsh sense of justice. 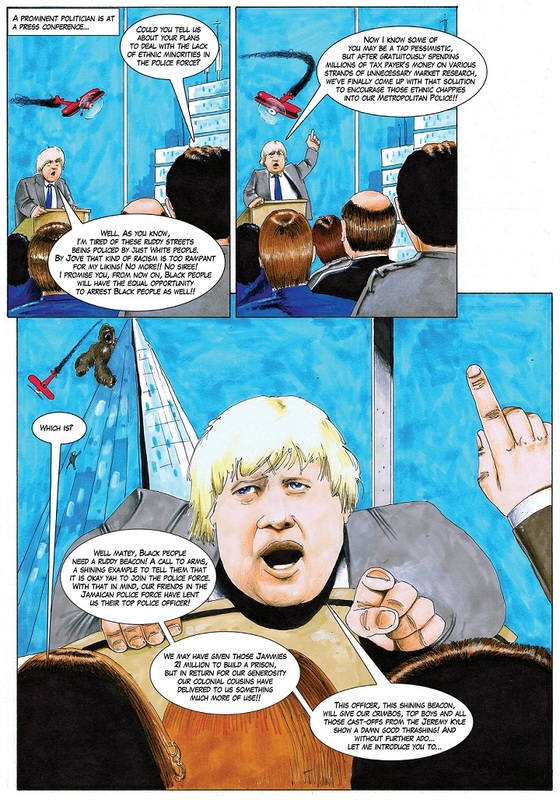 This is, by turns, a very silly comic (think Monty Python, for starters) and, ultimately, an eye-opening and worthwhile read. Is that Brexit heartthrob Boris Johnson? 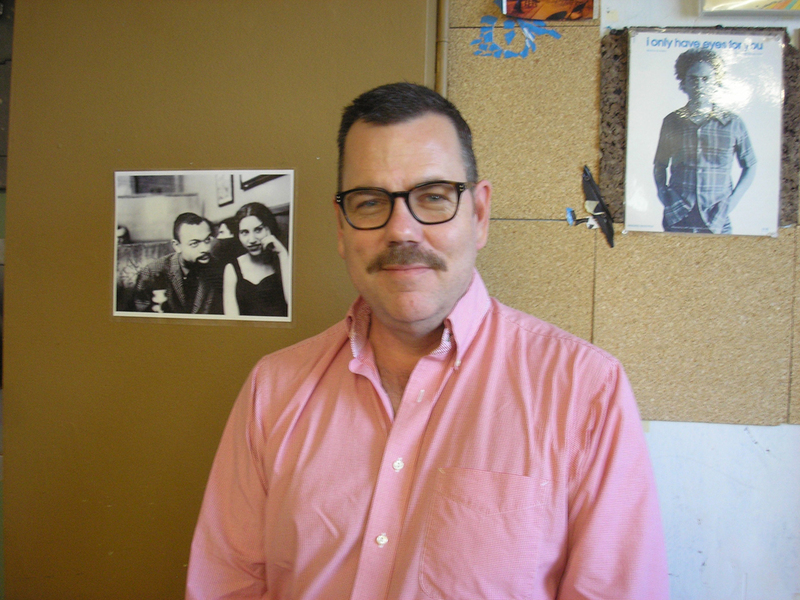 This comic’s artist, Joseph Samuels, is credited as one of the most popular comic artists to grace the pages of Skank Magazine and Black Eye. He is the co-creator of the popular Afro Kid comic strip on Vice.com. 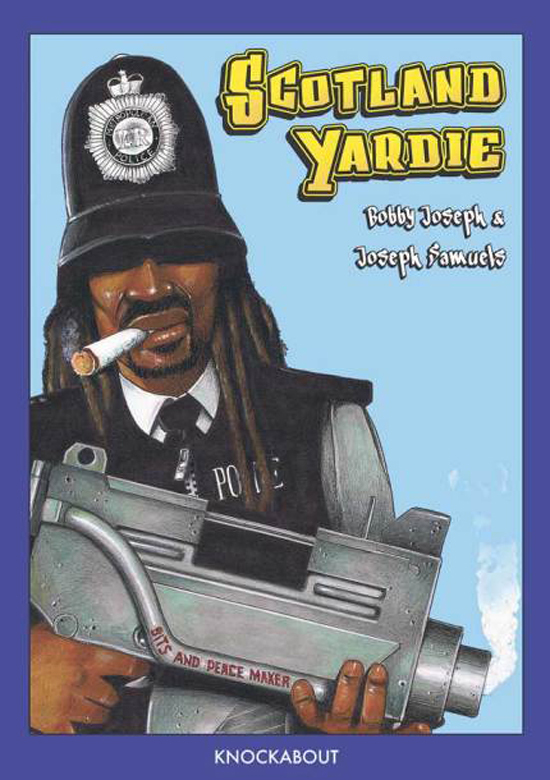 SCOTLAND YARDIE is a 100-page, full color, graphic novel, published by Knockabout. For more information, and how to purchase, visit Knockabout right here. I bring to your attention a funny and thoughtful comic with a cannabis theme that I’m excited about. You can support the Kickstarter campaign running thru August 31st right here. 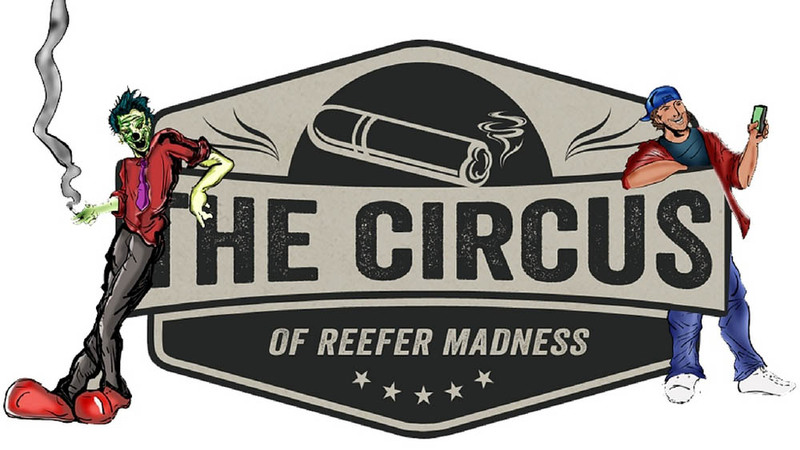 The project’s creator, Jeremy Myers, has found a sweet spot for comics and cannabis fans alike with this mashup of humor, horror, and political commentary. 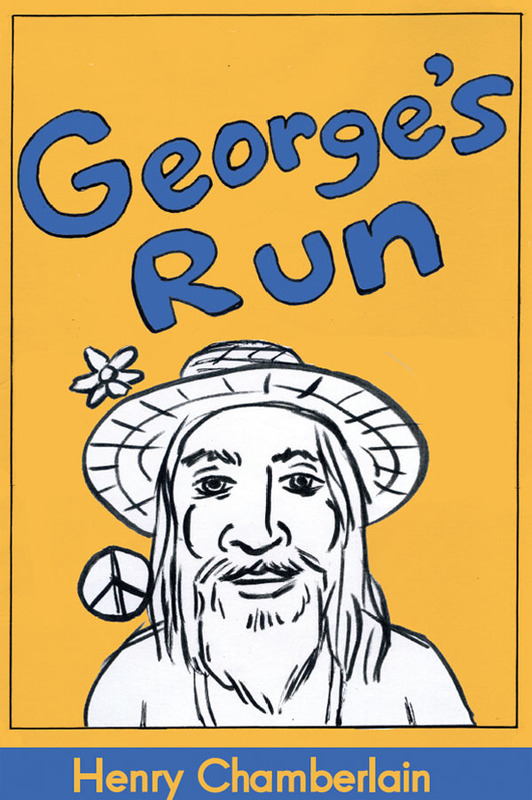 Cannabis and comics do indeed mix, going at least as far back as the Sixties underground. Here is a new generation’s turn. David Schmader is an American writer known for his solo plays, his writing for the Seattle newsweekly The Stranger, and his annotated screenings of Paul Verhoeven’s “Showgirls.” He is the author of the 2016 book “Weed: The User’s Guide.” And he is the Creative Director of the Greater Seattle Bureau of Fearless Ideas, a literary arts center offering free programs for youth ages 6 to 18. I had the opportunity to interview David and discuss better approaches to community and seeking common ground. Locally, for those of us who are a part of the Greenwood neighborhood of Seattle, we have been undergoing a recharge, a rallying around, after a gas leak explosion that tore into the fabric of everyday life. With BFI preparing to return to its original Greenwood site this month, it seemed to me a good time to check in with a thoughtful leader in our community. I begin our interview going back to that March 9th gas leak explosion in the middle of the night. Fueled with cups of coffee, we settled in at Couth Buzzard Books for this interview. 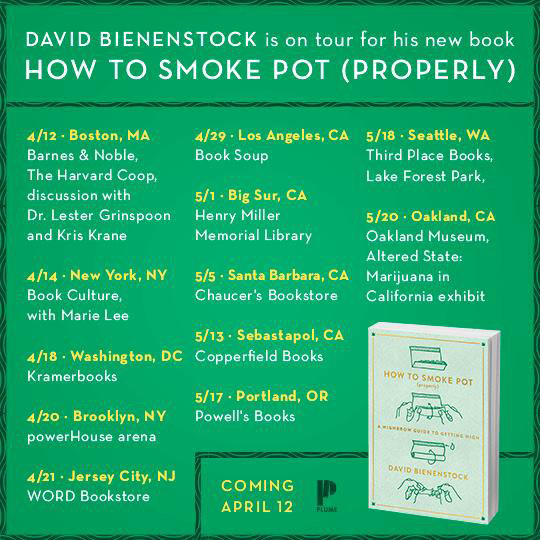 For those of my readers in Seattle, be sure to visit Third Place Books and meet David Bienenstock, VICE weed columnist and author of “How To Smoke Pot (Properly).” This is part of David’s book tour in support of his exciting new book. On May 18th, David is at Third Place Books in Lake Forest Park. On May 20th, his final stop will be Oakland Museum of California for “Altered State: Marijuana in California,” the first-ever museum exhibition to focus on marijuana in California today. 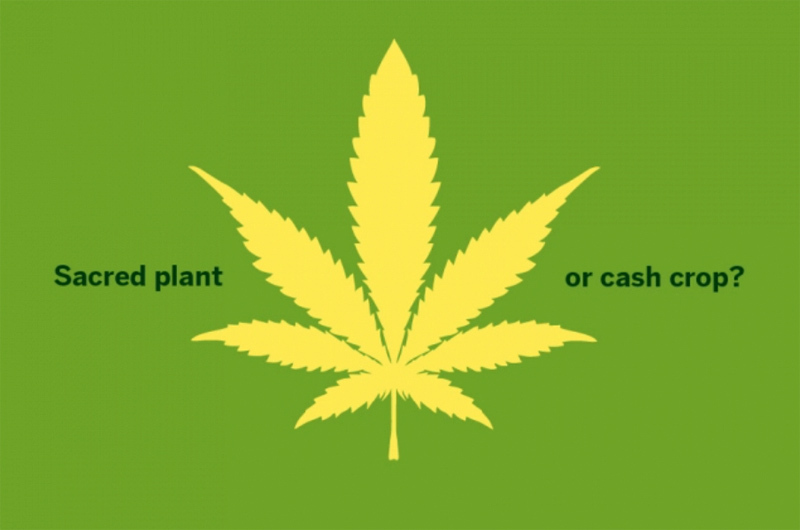 Once linked to all manner of deviant behavior and literally demonized as the “Devil’s Lettuce,” cannabis sativa has recently enjoyed a long-overdue renaissance. 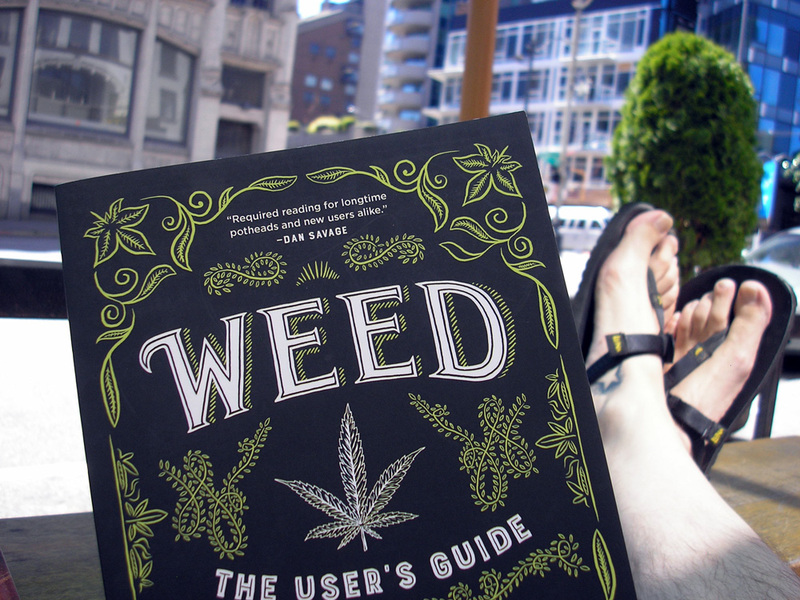 David Bienenstock charts the course for this bold new post-prohibition world, with suggestions on how to best utilize and appreciate a plant that’s at once a lifesaving medicine, an incredibly nutritious food, an amazingly useful industrial crop, and a truly renewable energy source. 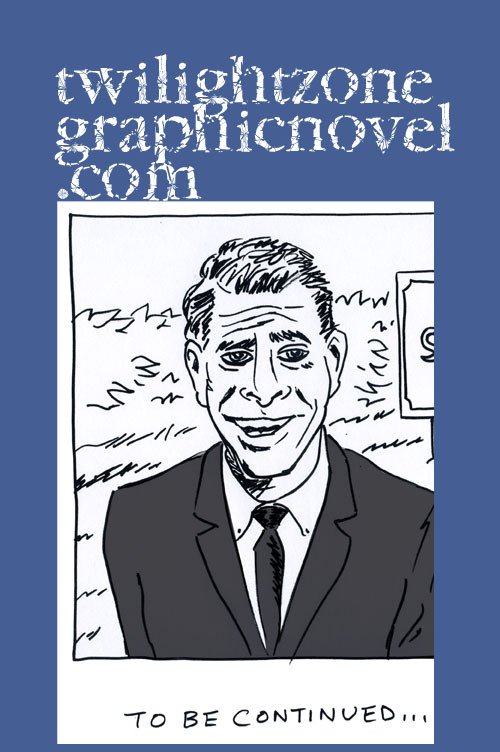 Press raves so far include Vanity Fair, Rolling Stone, Food & Wine, Slate.com, Mashable, Comics Grinder, and elsewhere. See you at Third Place Books.